Mobile printing couldn't be easier with Samsung's advanced NFC technology. 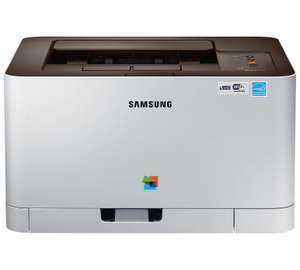 Just tap a compatible NFC-enabled smartphone on the printer to automatically install Samsung's free Mobile Print App, if it's not already installed on the phone, and then connect instantly to the device automatically. Supplied with 700 page black toner and 500 page colour toners. Compatible with PC and Mac.A4 print speed - black text: 18ppm (pages per minute).A4 print speed - colour text: 4ppm (pages per minute).Up to 2400 x 600dpi print resolution.150 sheet paper capacity.Uses 4 ink cartridges. USB port.Wireless/WiFi enabled.Ethernet.Apple AirPrint.Google Cloud Print.Mobile print enables printing direct from your smartphone or tablet through brand specific apps. Weight 9.96kg.Ink cartridge included.USB cable included.Size H21.1, W38.2, D30.9cm.EAN: 8806086702478. Found this deal while looking for a laserjet printer and I'm pretty sure it's a good deal!?! Be warned, a set of generic/refurbished toners, up to 1,500 pages black and 1,000 pages each for cyan, magenta and yellow, costs an eye watering £75.60 - £115. Be wary when buying this printer as the terms and conditions you agree to upon driver installation allow Samsung to capture your print data and send to third parties. toner supplied with the printer:- Black Toner Cartridge (~700 pages)- Cyan …toner supplied with the printer:- Black Toner Cartridge (~700 pages)- Cyan Toner Cartridge (~500 pages)- Yellow Toner Cartridge (~500 pages)- Magenta Toner Cartridge (~500 pages)link to the full specification pageBe warned, a set of generic/refurbished toners, up to 1,500 pages black and 1,000 pages each for cyan, magenta and yellow, costs an eye watering £75.60 - £115. That's not at all unusual, in fact it sounds quite cheap for good ones. However, they last so long that it still works out way better than any inkjet and without all the problems of inkjets drying out. As with these printers, you buy and throw it away once the toners run out, unless you can get the toners cheaply. This one works out as around 20p per colour page in toner. If you cannot get refils at signficantly less, you throw it away the printer and buy a new printer. But at this price it is not worth it! I don't print a lot. Would this bundle still work in 2 years time with the same cartridges installed? Be wary when buying this printer as the terms and conditions you agree to …Be wary when buying this printer as the terms and conditions you agree to upon driver installation allow Samsung to capture your print data and send to third parties. I don't print a lot. Would this bundle still work in 2 years time with the …I don't print a lot. Would this bundle still work in 2 years time with the same cartridges installed? Should do, but don't quote me and ask for a refund. As with these printers, you buy and throw it away once the toners run out, …As with these printers, you buy and throw it away once the toners run out, unless you can get the toners cheaply.This one works out as around 2p per colour page in toner. If you cannot get refils, you throw it away the printer and buy a new printer. Anyone know if you can refill the cartridge directly with toner or whether its a microchip based type? i have 1 for sale if anyone is interested 7 months old £40 still about 50% toner left excelent printer,mrs purchased it to print guest cards for my daughters wedding,but dont get used now. I was interested until I saw the replacement toner costs! I misread it. At 20p a page, I would not buy it. It is too expensive. As with these printers, you buy and throw it away once the toners run out, …As with these printers, you buy and throw it away once the toners run out, unless you can get the toners cheaply.This one works out as around 20p per colour page in toner. If you cannot get refils at signficantly less, you throw it away the printer and buy a new printer. But at this price it is not worth it! You're not well named and your maths is very suspect too! Yes. I just opened the box and started using a laser printer I had bought and stored 7 years ago and it's perfect. Another reason not to use inkjets. One could argue if you print in single colours the cost per page is 4.545p page per copy in toner costs. 9999/2200 = 19.998p per copy colour assuming equal distribution of colours. Colour Laser printers are great - Usually cheaper to run even with the genuine cartridges, and always ready to go. I've lost so many cheap (or not so cheap) inkjet printers over the years due to blocked print heads - never again! However choose wisely when you purchase your printer - look at the cost of consumables. I've got a Dell colour laser - and 3rd party toners are very cheap for this one, but sadly Dell are no longer making new printers. Nowadays I'd probably say buy either a Brother or OKI printer, as there are cheap 3rd party toners available for both of these. 3rd party toners for other printers tends to be quite a bit more expensive (but it does vary - actually this one isn't too bad - around £25 for a black 3rd party replacement). That's not at all unusual, in fact it sounds quite cheap for good ones. …That's not at all unusual, in fact it sounds quite cheap for good ones. However, they last so long that it still works out way better than any inkjet and without all the problems of inkjets drying out. Not really, I've been paying around £20 for a refurbished set to my 1250c for years now, they last just about the same. Not really, I've been paying around £20 for a refurbished set to my 1250c …Not really, I've been paying around £20 for a refurbished set to my 1250c for years now, they last just about the same. Hi. I have a 1250c: can you point me towards compatibles which you know are reliable (compatibles vary so much in quality)? Thanks. Hi. I have a 1250c: can you point me towards compatibles which you know …Hi. I have a 1250c: can you point me towards compatibles which you know are reliable (compatibles vary so much in quality)? Thanks. I don't really print that much so just buy a set with decent reviews on amazon every year or so, the one I got last time is no longer available. Sorry I can't help much. I've got this printer and I'm very happy with it. Just got 4 pack genuine Samsung toner off eBay for £80. Some refills don't work as they are chipped carts. However no ink clogging issues. Every page as good as first. Easy print from PC, Android or IPhone. I was HP certified engineer but rate this for the money. One could argue that if you were to print in each colour only but miss …One could argue that if you were to print in each colour only but miss half the page off each print, the page count would then be 1000 x 3 +1400 = 4400, so using your maths we're down to 2.5p/sheet...getting cheaper by the minute.The fact that you'd have wasted 4400 sheets of paper hasn't been factored in. "One could argue if you print in single colours the cost per page is 4.545p page per copy in toner costs." This clearly specified toner costs and nothing more. Paper costs depend on the type of paper used and quality. May be you should read what was typed. You analysis seems to be similar to Kathy Newman whne interviewing Jordan B Petersen. You can actually change that setting. Now £129.99 if you can find stock.... still cheaper than a replacement set of 4 cartridges! I've had mine a year following a deal on here, still on the starter cartridges, just used the black up now. Excellent print quality, fair speed. Good VFM.